UK-Elect Scottish Parliament Forecast, March 2016. This is the latest UK-Elect forecast for the 2016 Scottish Parliament Election, created on March 8th 2016 using Scottish Parliament opinion poll percentages based on the latest opinion polls. It shows the SNP retaining control of the Scottish Parliament with an increased majority. Further forecasts will be made at frequent intervals before the next Scottish Parliament Election. The percentages input for this forecast were based on the latest opinion polls. The percentages used for this forecast were - Constituency vote: SNP 52% Lab 21%, Con 16%, Lib Dem 6%, UKIP 2%, Green 2%. 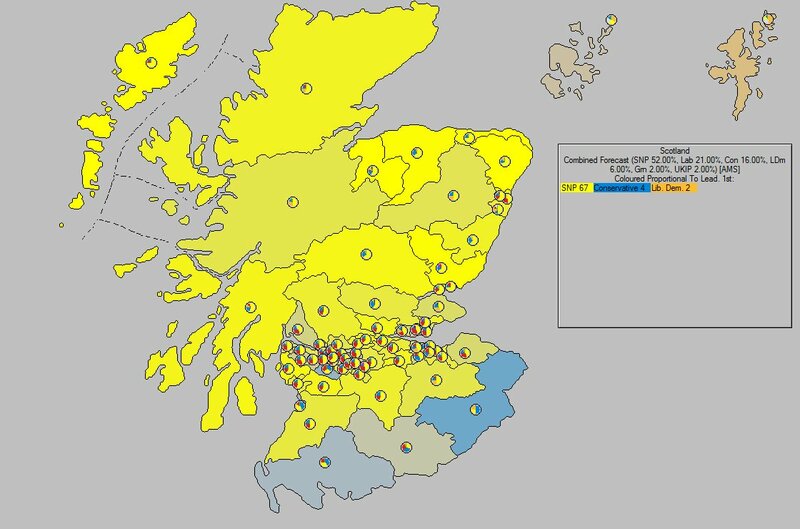 Regional member vote: SNP 48%, Lab 19%, Con 16%, Lib Dem 7%, Green 6%UKIP 3%. Other parties votes were not specifically set. AM Seats - Lab Gain 4, Con 3, SNP Lose 9. 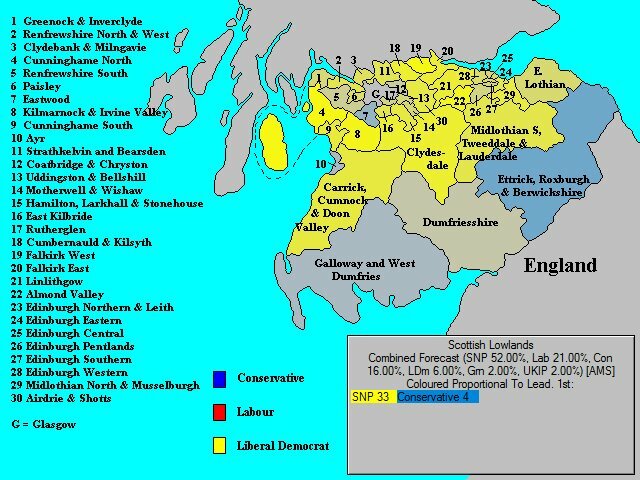 Notes: The forecast base was the 2011 Scottish Parliament Election, although gains are compared to the current situation. The UK-Elect v10.0 method was used (UK-Elect supports many different alternatives, including "classic" methods such as Uniform National Swing, Proportional, and Proportional Loss, with or without a threshold). The forecast was (of course) made using the Additional Member System used in the Scottish Parliament elections. The "adjust percentages for date of election" option was not used - i.e. this forecast is a "nowcast" based on current percentages.